One of the most dramatic consequences of Einstein's theory of special relativity is the "relativity of simultaneity", the fact that events perceived as simultaneous by one observer appear separated in time in a different frame of reference. In this Demonstration, light pulses are emitted at the center of a moving train and strike both ends. The pulses can then be reflected back toward their source. 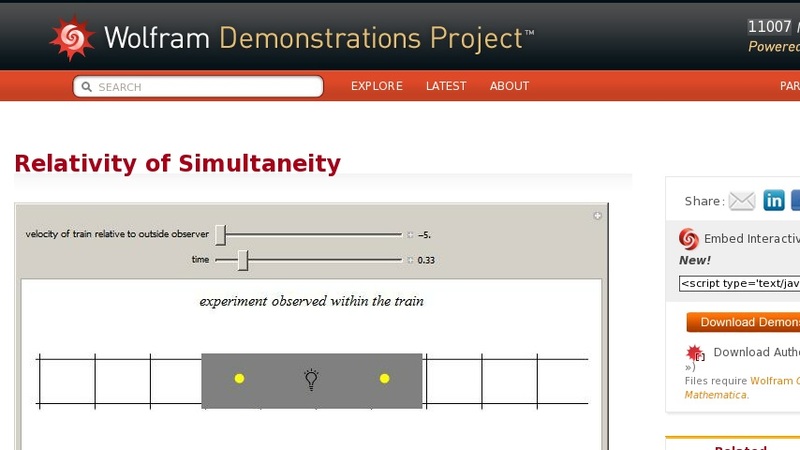 An observer on board the train sees both pulses moving at the speed of light and striking the ends of the train simultaneously, regardless of the train's velocity; an observer outside the train sees both pulses moving at the speed of light and striking the ends of the train at different times, depending on the speed and direction of the train's motion.